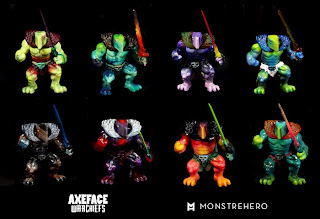 MONSTREHERO: Axeface Warchiefs Invade Friday, Nov. 1st at 12PM EST! Axeface Warchiefs Invade Friday, Nov. 1st at 12PM EST! Axeface, the Scourge of Pre-History, has enlisted his brethren to combat their arch-foes, the skeletal Skullminions! The disparate Axeface clans have sent the Warchiefs in response to his call. The Warchiefs combine ruthless cunning and wizardry with countless years of experience. Each of their War Swords is unique, forged from the blood and ashes of their vanquished foes and tempered with rage and magic. Their cloaks denote their rank in Axeface society and tell a story of their feats. 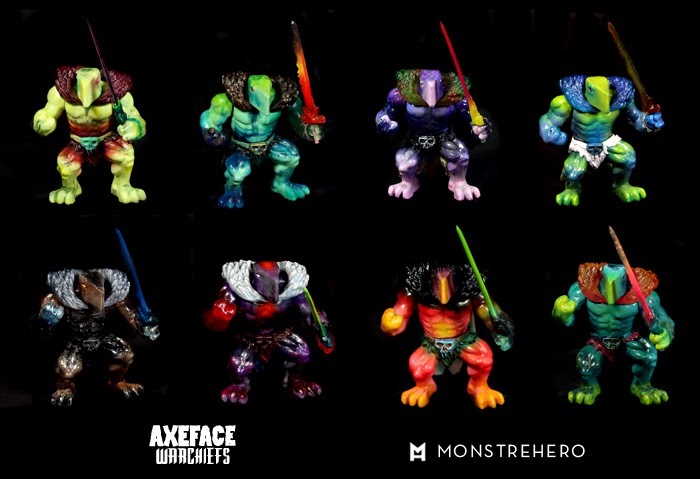 Each resin Axeface Warchief is completely unique and comes with a removable cloak and War Sword. They stand 4" tall and feature articulation at the arms and waist. They will be available for $85 each this Friday, Nov. 1st at 12PM EST at monstrehero.bigcartel.com!